Notable changes have been brought to security and authentication: Screens now supports 1Password’s extension for iOS 8, it can import saved passwords from iCloud Keychain, and it lets you log into the app using Touch ID. The latter is fairly self-explanatory: using the same fingerprint you have in the iOS Settings, you can secure Screens and make sure only you have access to your saved computers. Support for 1Password and iCloud Keychain helps in reducing time required to find passwords for logins: if you have a screensconnect.com password in iCloud Keychain, the app will automatically prompt you to use it; in any other password field of the app – whether it’s for a computer or your Edovia account – you’ll always have an option to bring up the 1Password extension and find your existing logins. The overall design of the app has been refined: UI elements have been polished, animations have been tweaked, and everything looks a bit cleaner than before. Screens now supports Adaptive Display on OS X for a faster and more accurate visual experience, but it also lets you scale down the remote display when you’re prioritizing speed over image quality (when you’re on slow 3G, for example). In my tests with a local MacBook Air and a remote Mac mini, Screens performed admirably. Adaptive Quality is based on a concept similar to the Progressive JPEG format, in which data is compressed in multiple passes of progressively higher detail. As a result, everything is faster and looks good. With this 3.5 release, Edovia fixed one of my longstanding sources of frustration with the app: you can now sync the local and remote clipboard and have real copy & paste between Screens on your iOS device and a remote computer. 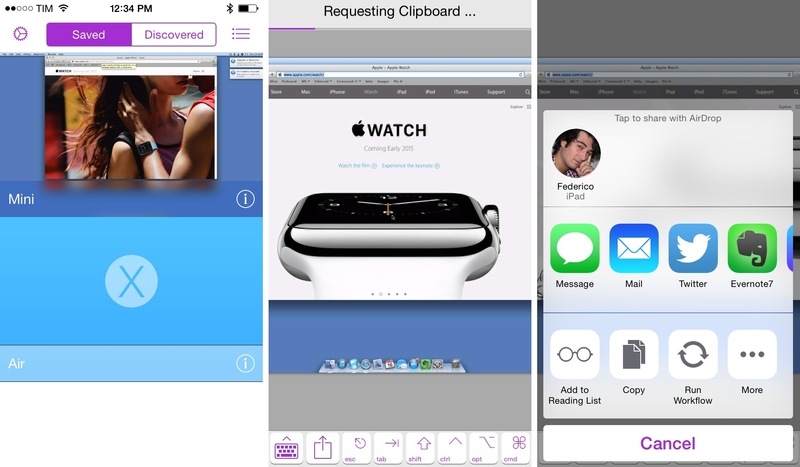 The feature works like I always wanted it to: if you tap Send Clipboard, the contents of your iOS system clipboard are sent to a remote computer, where they will replace its clipboard; if you choose to receive the clipboard, you can replace the contents of the local iOS clipboard with the remote one’s. When you receive the clipboard from a computer, Screens even lets you run action and share extensions – and, with the new version, the clipboard can be either text or images. This is the kind of clipboard support that I’ve always wanted to see in Screens and I’m glad that Edovia added it without complicating the app. I often need to share URLs and other bits of text between my iPad and Mac mini server, and this change has allowed me to do it more easily. In terms of screen sharing, Screens 3.5 brings two new features to simplify connections to remote or local computers. If you have a computer with multiple accounts and you want to log in as one of the configured users but share the current session’s screen, the app can now send a screen sharing request and ask for permission to view the screen. In a similar vein, Edovia has built a free utility called Screens Express to let people request help by sending a link to view their computers through Screens. We’ve all been here before: whether it’s a relative who’s having problems with iCloud or a child who’s not sure what to do with final_draft–2.pdf on their desktop, figuring out other people’s computer problems is much easier when you can view their screen. 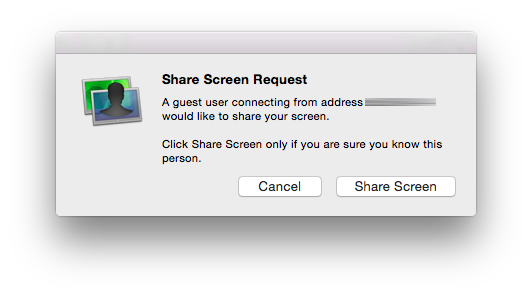 Screens Express is an app that sets up a Mac for screen sharing and generates a link to view the screen. The person who needs assistance can share this link over email or iMessage; when you’ll receive this link, tap it, and Screens will open and send a request to view that remote computer. It’s a complex feature designed to be effortless and easy to share, and I applaude Edovia for making a lightweight tool that will make it less painful to help my parents with their new computer. Screens 3.5 doesn’t revolutionize the app I already know and love; instead, it brings welcome iOS 8 features that make the app more secure through Touch ID and faster access to strong passwords. Better clipboard support and the ability to run extensions inside the app are the icing on the cake for an app that I use every day and that I’ve trusted for over three years now. Screens 3.5 is available on the App Store.